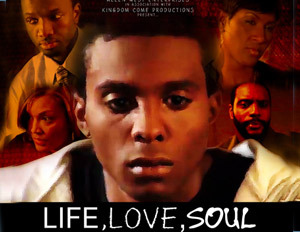 According to media personality Egypt Sherrod and actress Terri J. Vaughn,Â Noel Calloway‘s drama, Life, Love, Soul, won the Audience Choice Award at the 2011 UrbanWorld Film Festival because it’s a story that viewers can relate to. The movie tells the story of a talented young man named Roosevelt, who struggles to regain control of his life after the death of his mother and brother force him to live with his estranged father. The mandatory reunion leads Roosevelt to revisit past mistakes, while also making new ones in the process of reconciling with his father. In select theaters on April 13, Life, Love, Soul is a tragedy to triumph story that deals with teen pregnancy, alcoholism and rising to the top in the face of adversity. BlackEnterprise.com chats with two of the film’s stars, Egypt Sherrod and Terri J. Vaughn about why the film is authentic, working with co-star Tami Roman of Basketball Wives fame and being a working mom on set. What do you want people to take away from the Life, Love, Soul? Vaughn: It’s a slice of life. It’s a real story about what’s going on in the lives of youths and how our families deal with it. It’s always great to be able to tell our stories, because we have so many so, I’m happy that I can take my nieces and my nephews and my son to the movie and they’re able to see reflections of themselves up on screen. And the other thing is how big forgiveness is in family. I hope that young people learn to make better choices and decisions for themselves and just as a parent has to learn to be able to roll with the punches with the mistakes that our kids make sometimes, and even in disappointment and being angry, that we still have to be there for them. Terri, your character in the movie seemed to allow her anger to take precedence over instruction for her daughter. How would you approach that in real life, since you are a mother? 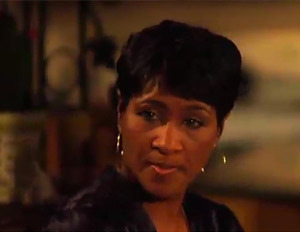 Terri J. Vaughn, in "Life, Love, Soul"
Vaughn: You have to think of where her anger was coming from. It was more disappointment and that’s how we saw her deal with it–by being angry, but it was really based on disappointment. For me, I would definitely say disappointment and possibly even angry but that’s a first reaction response and I think that once it settles in then that acceptance of the situation comes in being there for my daughter. I would think it would probably go something like that for me. Egypt, your character was at odds with the young man’s father who wasn’t really around for his children but blamed that on the mom. However, it kind of seemed like he was making excuses. What advice do you have for fathers dealing with mothers who have cut them out of their kids lives? Sherrod: I related with this particular plot because I dealt with the same thing growing up as far as my biological father. His story is he wanted to be there and of course there’s two sides to every story, but I firmly believe that if you love your child then no one can keep you from your child; it’s not a matter of the mother not letting you be around. A father and a mother, it takes two to tango and they made this child so no one is able to keep you from your baby if that’s truly what you want. I felt it was a sob story and that’s why my character didn’t take too kindly to the character because it was a low down dirty excuse and to me it’s an easy way out.